Anyone who has ever rescued or adopted an animal will not only love this book, they will probably want to adopt author Bob Tarte as well. On the other hand, people who are not animal lovers will find this book completely inscrutable, which is their loss. Music reviewer Bob Tarte starts off his journey into becoming a variation of Dr. Doolittle innocently enough. After years of being an urban dweller in downtown Grand Rapids, he moves to the farmland surrounding Lowell, Michigan where he expects to write and enjoy a life filled with rural beauty and tranquility. But fate - and his indomitable wife Linda - have other plans. Once settled in his 100-year old farmhouse, Tarte barely has time to acclimate to vultures circling overhead, the surrounding swamp and the occasional gunshot blast across the river when Binky, a dwarf Dutch bunny, joins the household. Mistakenly assuming that a rabbit would be a relatively maintenance-free pet, Tarte soon learns that Binky requires more attention than the most spoiled toddler. And a toddler with a sour disposition to boot. However Tarte is amazed that rather than dissuading him from adopting more animals, the Binky experience instead leads to their home becoming a virtual petting zoo/aviary. The aviary begins when Linda buys a cheerful canary named Chester, soon followed by a moody pocket parrot, two African greys, another canary, parakeets and several doves. But the heart of the book is the introduction into their family of birds not usually regarded as pets: ducks, geese, starlings and turkeys. Fearless Linda is always on the lookout for any farm bird that seems appealing and/or destined to be abandoned or eaten. Tarte is simply unable to resist both her and the animals. Once the ducks enter the picture, Tarte is forced to learn how to construct a seemingly endless series of fences and enclosures on his 3-acre property. Both Tarte and his wife also find themselves treating one medical emergency after another, aided by a local team of vets who don’t find it strange when the Tartes bring in a duck with a broken femur, a goose stricken with aspergillosis, or a turkey who has been attacked and blinded by a fellow turkey. Btw, the chapters describing the treatment and recovery of the goose and the turkey are genuinely moving, and will have you deciding that Bob and Linda deserve the St Francis of Assisi Award for Valor and Dedication. 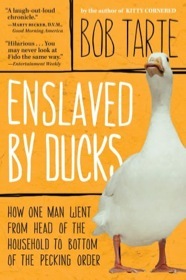 By turns heartfelt and humorous, Enslaved By Ducks is always enjoyable as well as informative. Who knew that starlings could be trained to speak as well as any parrot? Or that it’s possible to call an owl onto your property? And while it is common knowledge that wild geese are reluctant to let humans touch them, when Liza the goose unexpectedly cuddles up next to Tarte, you’ll feel as gratified and awed as he does. Without a doubt, he and Linda have earned such wonderful moments. Indeed the enormous amount of hours each day that has to be devoted to feeding, housing and caring for their animals leaves one marveling that Bob Tarte ever found the time to write this book. But once you’ve started to read Enslaved By Ducks, you’ll be glad that he did. 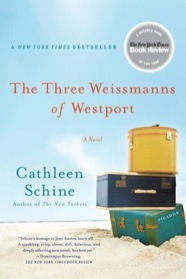 The Three Weissmanns of Westport is the latest in a recent trend of books and films that are modern day versions of classic novels. And while everything from The Odyssey to Anna Karenina have been re-imagined, perhaps no author has had her work updated more often than Jane Austen. Starting with the delightful film Clueless which gave us an Emma set in 1995 Beverly Hills to every singleton’s favorite Pride and Prejudice take-off, Bridget Jones Diary, Austen’s heroines and plots seem perennially suited for a makeover. Set in modern day Connecticut, The Three Weissmanns of Westport is a clever retelling of Austen’s Sense and Sensibility. The basic outline of the novel remains the same: an older woman is forced to leave her elegant home (this time a penthouse in the upper East side) and finds she and her two daughters must accept the charity of Cousin Lou and his wife who allow them to take up residence in a rundown house in Westport. Austen’s story is set into motion when the patriarch of the family dies. In Schine’s retelling, the 75-year old Betty Weissmann is supplanted by a younger woman. And this gold digger named Felicity (frequently dubbed ‘Duplicity’ by Betty) not only intends to marry the nearly 80-year old Jacob Weissmann, she wants the penthouse too. In a nice touch that Austen would have appreciated, Betty Weissmann prefers to call herself a ‘widow’ rather than a soon to be divorcee, and spends the entire book commenting on her widowed state. But the focus of this book - as in Austen’s classic story – remains on the two daughters. And although there is indeed one sister who is impulsive and romantic, and another who is reliable and sensible, their ages and histories are vastly different from the young unmarried Dashwood girls. For one thing, both women are middle-aged. Annie is a library director and divorced mother of two grown sons. Always the responsible one, Annie temporarily moves into the cottage with her mother and sister to look after them. Her beautiful sister Miranda is a forty-nine old literary agent currently mired in debt and scandal, a result of several of her authors behaving like the erstwhile memoirist James Frey. Yet their emotional journeys mirror that of Eleanor and Marianne Dashwood. Annie has long pined for Frederick Barrow, bestselling author and brother to Felicity. But each time she and Barrow seem about to deepen their relationship, his adult children jealously intervene. Miranda, on the other hand, loves the tumult of falling in and out of love numerous times. In this middle-aged version of Sense and Sensibility, satire reigns supreme as Schine has great fun making sharp observations about family, money, romantic love, divorce, marriage and yes, even Connecticut. Lovers and potential suitors come and go, and readers will be both amused and moved by what the three Weissmann women learn and endure. Luckily there is enough of a difference between the 19th and 21st centuries that readers will not know for certain how things will turn out for any of the main characters until the very end. Whether or not you’re an Austen fan, The Three Weissmanns of Westport is a witty and engaging comedy of manners. I suspect Jane would be pleased. In this delightful book, Farmer Brown is having a problem with his cows. It seems they have discovered a typewriter in the barn and decide it is the perfect way to communicate their wishes to him. Finding the barn too chilly, the cows send Farmer Brown a typewritten note asking for electric blankets. When he angrily refuses, the cows go on strike. The cows are soon joined by the chickens who want an electric blanket as well. Farmer Brown is quite upset that he has cows that won’t give him milk, and hens that refuse him eggs. And there’s all the clicking and clacking coming from the barn as the cows type their demands. Before things get totally out of hand, a farm duck offers to act as peacemaker, agreeing to deliver typewritten notes and replies between the cows and Farmer Brown. But just when it seems that everyone will get what they want, the ducks come up with a surprising – and amusing – twist of their own. Very young children will enjoy the boldly drawn watercolor illustrations and the repetitive phrasing of “Click clack, moo. Clickety clack, moo” whenever the cows are typing. Older children will appreciate the humor of Farmer Brown’s situation, especially as more animals join in. As for adults, I confess that I laughed out loud when I read how this clever little story ends. 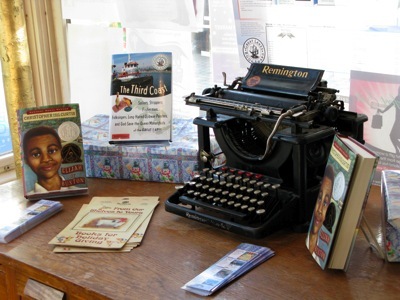 Btw, author Cronin is also a lawyer who just happens to collect antique typewriters. No doubt, she thoroughly enjoyed writing this charming labor dispute between a farmer and his animal employees, especially as negotiations were accompanied by the sound of those marvelous old-fashioned typewriter keys. 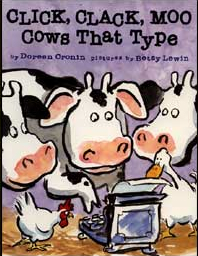 Wonderfully illustrated, fast paced and amusing, Click, Clack, Moo: Cows That Type is sure to be a book both you and your child will have fun reading again and again. Before Jon can celebrate his 16th birthday, and receive an odd heirloom ring, his father disappears in a flash. No one believes him, however—and more odd things begin to happen. 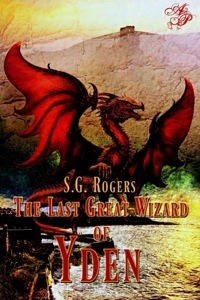 This coming of age story includes magic, wizards, dragons and a hero who travels to an alternative reality to seek answers. The most interesting element is Jon’s talent for drawing, which lends some great twists in a solid and satisfying tale of adventure. During those last long weeks of winter, both adults and children begin waiting eagerly for the first signs of spring. Yet it seems that the more we long for the first blades of green grass to appear, the drearier the outside world stubbornly remains. This feeling of frustrated anticipation is captured perfectly in And Then It’s Spring. 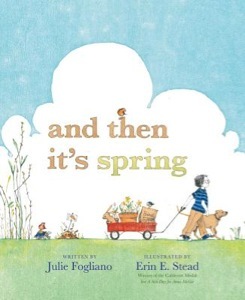 Debut author Julie Fogliano has been lucky to be paired with illustrator Erin Stead, a 2011 Caldecott winner and resident of Ann Arbor, Michigan. Stead’s artwork has a quiet elegance to it, which nicely complements the haiku-like quality of the text. In fact, Stead’s artwork reminded me of Maurice Sendak’s wonderful illustrations in the classic Little Bear series, which is high praise. The book begins as a young boy dressed for winter walks though a bare brown landscape with his dog, while he says, “First you have brown, all around you have brown”. But maybe if they plant a garden, spring will arrive more quickly. However once they’ve dug, seeded and watered, there is still more waiting to be done. Best to play and wait, then wait some more, since spring must come in its own time. And on that final page, it does. This is a quiet book which subtly teaches a child that patience and hope will be rewarded. And when at long last, those first green shoots of spring appear, the young reader is likely to be as relieved and pleased as the boy in Fogliano’s book. In fact, this may be a perfect book to take out every February, just when the whole family is restless with cabin fever. Adults just don’t get the dumbness factor here. But kids love Pilkey’s odd humor (Sue Denim = Pseudonym - get it, get it??? 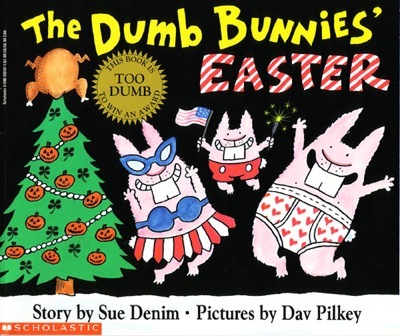 ), and these bunnies are sooo dumb – “how dumb are they?”—they get the holidays all mixed up! A Christmas tree at Easter? Trust the kids, every time. They’re smart enough to eat this stuff up and laugh hysterically.